5 Jan 70 Assignment of motion picture cameramen to AFTN stations requested. 19 Jan 70 Congressional inquiry on alleged news censorship in AFTN received. 20 Jan 70 AFTN dispatches reply to alleged news censorship congressional . 24 Feb 70 New AFTN News Sensitivity Guidelines placed in use. 25 Feb 70 Assignment of motion picture cameramen to each AFTN station disapproved by 13th Air Force. Feb 70 The Headquarters engineering staff conducts a TV experiment at U-Tapao station. Mar 70 AFTN loses $ 1,000 monthly obligation authority for buying eqpt. 3 Mar 70 Mr. Hugh Woodward, U.S. Embassy Public Affairs Officer, visited from Bangkok to explain the new sensitivity list. 10 Mar 70 A study is concluded on the use of AP and UPI circuits at all stations in the network. 20 Mar 70 Higher headquarters notified of manning problems in connection with unacceptable experience levels. 23 Mar 70 Request for UDL revision submitted to provide adequate manning for Network Newsroom. 26 Mar 70 Master production package mailed to all stations. 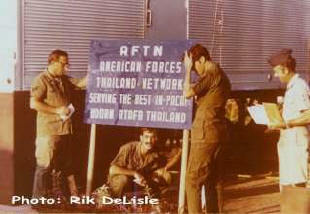 March 70 AFTN receives a request from the U.S. embassy in Vientianne, Laos for an Audio Distribution System. Mar 70 Notification received of “Apollo Plus 50” a production of AFTN Korat, winning a first place award in the annual Thomas Jefferson Awards contest. April 70 Ground broken for television studio at AFTN U-Tapao. 10 April 70 RF-4 Phantom crashes into station at AFTN Udorn. Nine broadcasters & engineers are killed. 17 April 70 Request from the Office of Information for the Armed Forces for operating information to help them answer Congressional inquiry. 18 April 70 AFTN submits request for design of emergency exits for television vans. 21 April 70 AFTN sends answer to request for information from IAF. 3 May 70 7/13th (DXI) requested further study of teletype operations in the network. 7 May 70 AFTN answers teletype study request. 8 May 70 Request forwarded through channels for increased service at Don Muang. 11 May 70 AFTN Udorn returned to local-mobile home-radio studios from Korat. 16 May 70 Command support message dispatched by Assistant Deputy Commander for 7/13th Air Force. 28 May 70 Testing begun for frequency modulation broadcasts at Udorn. 1 June 70 7/13AF (DXI) sends message urging quicker action on television restoration project. 1 June 70 “Tips on Thailand” radio program returned to air. 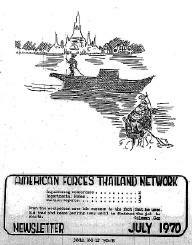 4 June 70 U.S. embassy in Bangkok notified 7/13 AF of higher headquarters approval for Ramasun television operation. 6 June 70 MACTHAI J6 notified AFTN of disapproval for additional circuit request. 10 June 70 Plans formed for wall-to-wall inventory. 17 June 70 Need for antenna maintenance assistance told to higher headquarters. 24 June 70 Lt. Col. LaFollette wrote Col. Cranston on the results of Sydney industry meetings. 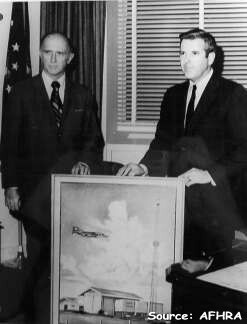 25 June 70 Lt. Col. LaFollette stressed “no publicity” policy. June 70 Emergency exits for TV vans arrived headquarters and shipped to outlying stations. 1 Sept 70 Memorandum of Understanding regarding AFTN radio service to the U.S. embassy in Vientiane, Laos. 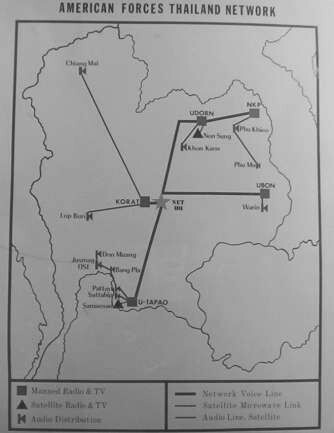 5 Sept 70 Secretary of the Air Force Office of Information granted permission to convert AFTN-Korat and AFTN Ubon to FM. 11 Sept 70 6001st Support Squadron advised that television termination at AFTN-Takhli would occur on 15 December l970. 6 Feb 71 Notified that cost of model for radio facility at OLAC Udorn RTAFB increased by $ 36,000. 8 Mar 71 Notified that AFTN was selected as a winner in DOD sponsored Thomas Jefferson contest. 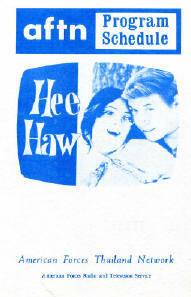 31 Mar 71 All operating locations levied to air two one-half locally produced programs weekly. 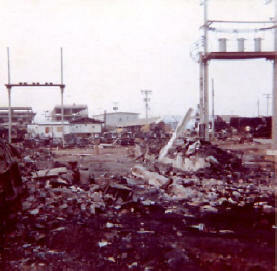 21 July 71 Report of survey approved by Hq PACAF relieving all concerned of liability for loss in connection with air-crash destruction of the Udorn TV facility. 15 Aug 71 American Forces Thailand Network initiated broad publicity of Cold Turkey II-- the drug information program. 25 Aug 71 Hq 13AF reinstated request for funds for installation of an automated Frequency Modulated Stereo (FMS) broadcasting for Korat, Udorn, and U-Tapao. 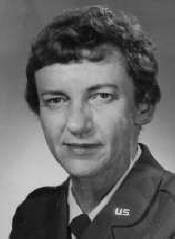 3 Sept 71 New squadron commander/network chief assumed command. 16 Sept 71 The Bronze Star Medal approved for seven American Forces Network airmen who survived the destruction of the Udorn TV facility. 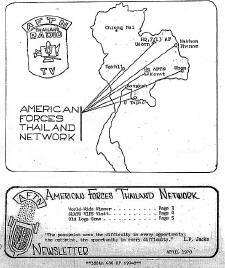 16 Sept 71 U.S. Army submitted an emergency requisition for 20 radio/TV technicians for assignment to American Forces Thailand Network . 29 Sept 71 Hq 13AF directed an additional 3 hours of daily (Monday through Friday) network TV programming. 24 Nov 1971 PACAF the headquarters that a new AFTN personnel assignment procedure had been approved by Air Force whereby all incoming AFTNers would channel through Korat for orientation and further assignment. 2 Dec l971 E-5s, E-6s, and E-7s assigned to the headquarters and Korat station were given a new billet area on base. 20 Dec 1971 The Ubon and U-Tapao stations taped the audio portion of the touring Bob Hope Christmas Show at their bases. The tapes were to be used in the final color TV program to be aired in the United States. 22 Dec l971 The headquarters received its first copy of 13AF Regulation 23-25, the unit mission-organization directive. 31 Dec 1971 The AM radio facility was deactivated at Ubon Airport and an FM installation was activated. 1971 A1C Ron Hurst, Korat broadcaster, was honored by Billboard magazine as Military Disc Jockey of the Year for l971. It was the first known Billboard Magazine award earned by an AFTN broadcaster. 8 Jan 72 AFTN U-Tapao was among units cited by the Pala School District for their efforts to raise funds for the annual Children’s Day Fund Drive. 9 Jan 72 AFTN service discontinued to Khon Kaen. 11 Jan 72 AFTN service discontinued to Phu Khieo. 22 Mar 72 Audio Distribution System at Ko Kha Tech control, which was installed 31 January, became operational. Oct 72 Unit ordered seven FM transmitters with plans to convert to FM at all locations except ADS sites. 26 Nov 72 AFTN increased its television broadcasting schedule to 17 hrs. per day. Dec 72 Unit was subject of a manpower survey. 1 Apr 73 Nakhon Phanom converts from 770am to 101.9 FM. 1 May 73 Nakhon Phanom station begins broadcasting in FM stereo. 12 May 73 Commander briefs Thirteenth Air Force commander on AFTN mission and operations. 31 May 73 STL Link put in from Udorn station to Ramasun. 3 Jun 73 Ramasun converts from 1220AM to 101.9 FM. 30 Jun 73 U-Tapao converts from 1220AM to 101.9 FM. Sameasan converts from 1220 AM to 99.7 FM.